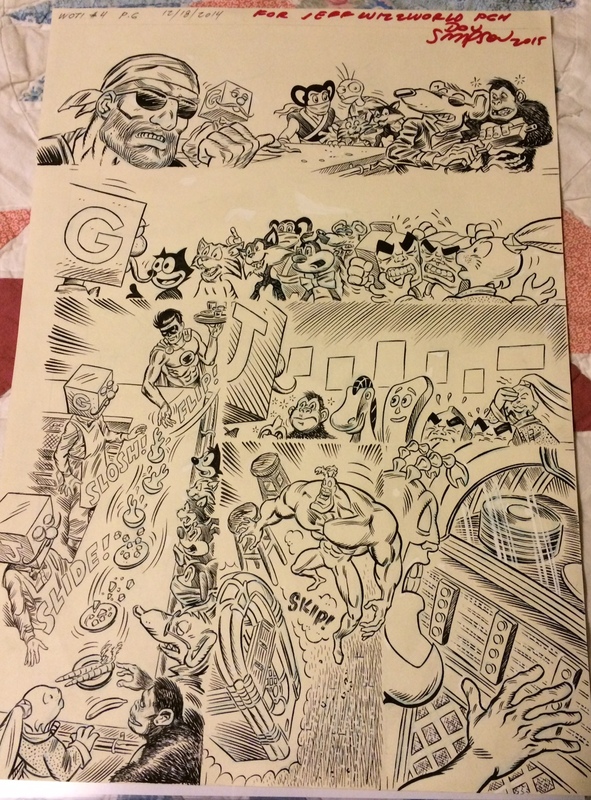 War of the Independents original art by Don Simpson! 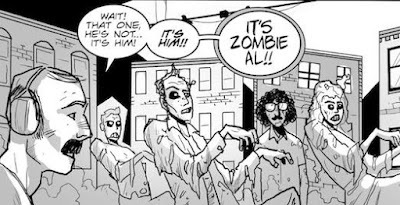 There are a number of really talented and impressive comic artists living in Pittsburgh, and I've been lucky enough to meet a number of them. 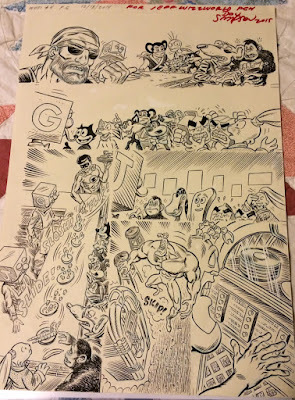 Over the last year I've had the pleasure of talking with Don Simpson on a number of occasions, and at last year's Wizard World Pittsburgh, Don gave me a page of original art from the upcoming War of the Independents #4. 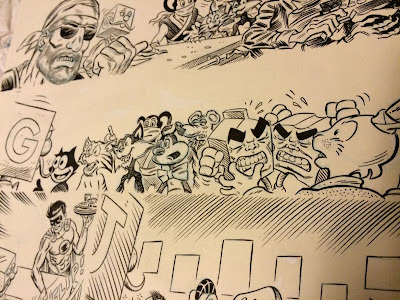 This issue of the series features a number of cartoon animals such as Usagi Yojimbo, Felix the Cat, Simpson's own Cowboy Gorilla and....The Tick. There are also some non-animal cartoon characters like Milk & Cheese and the Gumby characters. I wasn't expecting to get this page so it was a big treat to get a page of art from the guy who created Megaton Man, Border Worlds and other great comics. I would absolutely love to work out a Tick/Megaton Man crossover one of these days in an official capacity, but the two characters do actually meet in this issue as well. I'm hoping to see this issue in stores soon! Steve Geppi is the owner of the Diamond Comic Distributors, which is the only major distribution network in all of comics. There's been a lot said about Geppi in recent months, and a number of people in the industry have some strong opinions about the man. All I'll say about the matter is that the industry as a whole would be healthier with more than just a single major distribution system for comics in North America. I had the opportunity to share a table at the 2015 Baltimore Comic-Con last fall. After the opening night of the show on Friday, Geppi hosted an event for exhibitors and professionals at his very own entertainment museum. I didn't get to Baltimore until Friday evening, but since my hotel was right next to the museum, I grabbed my badge and went over to the museum, which is located right next to Camden Yards, the baseball stadium for the Baltimore Orioles. Much of what the museum holds is Geppi's personal collection of pop culture memorabilia, and I was stunned at much of what I saw. I had heard of the museum before, but I never knew what kind of things it had on display. I took a bunch of pictures and thought I'd share a few here. The layout and display of the museum is thoughtful and impressive, and there's a lot of different items to see, but I was of course most excited by the comics. As you can see at the top, Geppi has some of the most valuable comics in existence for all to see, including Action Comics #1 and Detective Comics #27, the first appearances of Superman and Batman. I spend a lot of time trying to figure out if these were even real copies or just facsimiles, and I overheard others asking the same questions. The staff let me know that yes, these are indeed the real things. The books were situated on a display that looked appropriate for the Constitution. The room held hundreds of comics and pulps from various eras, all the way up to ones that were fairly modern. 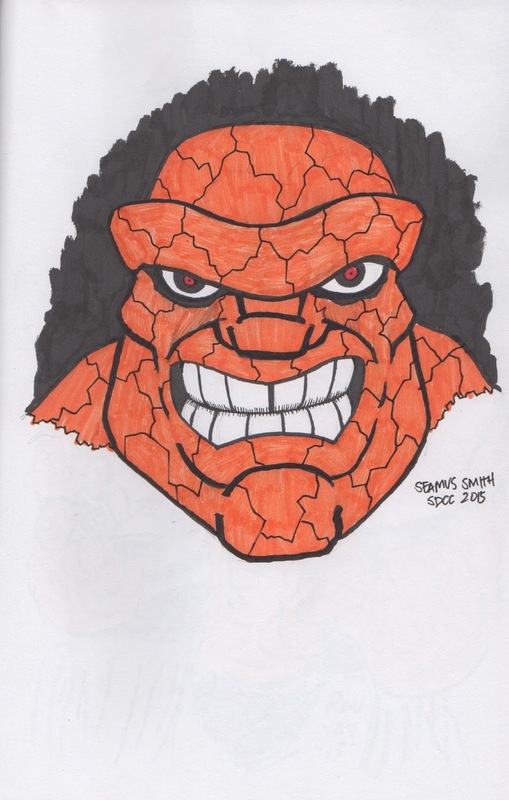 There was original art from Frank Cho in one section as well. Other than time periods, there didn't seem to be a theme to many of these sections. In addition to the obvious aesthetic qualities of this space, the movie posters that lined this hallway were simply incredible. There were posters from 80 years ago that looked brand new. How in the world were these kept for so long in such good condition? Maybe there was a sale at a movie studio lot. There was a wide variety of posters and prints to see. It seemed like there was always another room to see, each with at least one mind-boggling piece on display. One thing that stuck with me was just the preponderance of different items from all different eras. The different collections just seemed to go on and on. Oh, look, Larry. He even has some Dukes of Hazzard items on display. 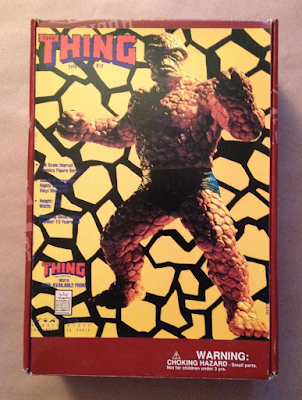 I saw a lot of movie memorabilia, the result of years of collecting and certainly millions of dollars spent. The museum also had items on loan, including an entire room dedicated to Will Eisner. There were dozens of pages on display that spanned Eisner's entire, decades-long career. And there was even some Frankenberry artwork! This whole exhibit was just a sight to behold. I showed up to the event toward the end, so I didn't get to spend as much time as I would have liked. I saw Geppi as I was leaving and expressed my disbelief at everything I had seen. It's hard to imagine that something like this museum even exists. If you're in the Baltimore area, you should take a few hours and take in everything that's here on display. It's impressive, to say the least. Oh, and it happened that the Cincinnati Bengals were staying at the same hotel that I had booked for the weekend. It was odd, seeing coaches, staff and players walks the halls. My wife wouldn't allow me to run through the halls shouting "THE PITTSBURGH STEELERS HAVE SIX SUPER BOWL TROPHIES", but I did announce my presence at least once. After all of the turmoil between the two teams during the 2015 season, I kind of wish I was a little bit louder, but I'd say there would have been a 20% chance one of the players (you know which ones) would have beaten me up by the vending machines. Can't wait until the 2016 championship season is here, Steelers. When I was a kid, I went through a phase where I built a number of models - mostly vehicles...and one time the USS Enterprise. I think it was something that my dad got me into, perhaps because he thought I needed a hobby. I usually managed to complete everything that I started, but it was always frustrating because there were often a number of tiny parts and decals that would never end up exactly right. And I would usually overpaint. Those days, though, have come and gone, and I don't know that I'd have the patience for models anymore, at least in relation to the quality of the product that I'd end up with. That's a lazy answer, I guess, but it's true. I think I'd rather spend my time doing other tedious tasks, such as write on this blog. Wait, that's not true. I love this blog. I do. ...and another with some artwork on the front instead. I'm not sure when one came first, but like I said, I think the insides are the same. It's almost hard to classify this as a model, as the pieces snap together and there are only a total of, like, six pieces to the entire thing. Most of the work comes from painting the model, which was the part (along with decals) I was the worst at when trying to build my own. Well, thank goodness for eBay, which lets me totally cheat the system by buying a model that someone else spent long hours putting together and painting. There are always a number of these up for auction, but one recently showed up at a steep discount, so I snatched it up and it arrived recently. Here are a few pictures of it, and also my cat, who was interested it. The model ended up being bigger than I expected, and heavier, too. It's a real solid piece. It's nearly a foot tall and the detail work is better than I thought it would be. To top it all off, the paint job is great. I like how the painter went with a classic black waistband as opposed to the white '80s/'90s version. There are two Thing models from around the same time (that I know of - the other one was made by ToyBiz). This is probably the nicer of the two. I'm happy to finally get a version that was built without having to do all of that painstaking work of *building it myself*. Also, I recently got one of the limited Pepsi Perfect bottles. What will I do with this? Who knows. But dangit, I got one. 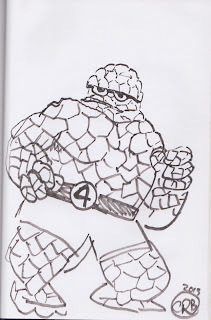 It's time again to check out the Thing sketchbook...which is actually almost full! I've only got a few more spaces and then...I guess it'll be time to start a new one. Caitlin Rose Boyle set up shop at the PIX show in 2015. I thought her work looked great, so I bought a few of her books and got this Thing sketch as well! Boyle just announced that she'll be working on the upcoming book "Jonsey" for Boom! Studios! I think I caught her off guard with this Thing request, which is inspired by Stuart Immonen's New Avengers cover. I imagine that Scoot's real first name is Scott, but as far as aliases go, "Scoot" isn't a bad one, especially for McMahon, who works on a lot of kids comics with Art Baltazar. We spent a while talking about the Fantastic Four while he drew...and I liked this so much that I got him to draw on the FF villains sketch cover that I'm also working on now. While making some of my final rounds on Sunday of Comic-Con, I found a booth for the Cartoon Art Museum in San Francisco. I took a trip to the museum in 2012 after Comic-Con and enjoyed it immensely. The booth was raising money for the museum by drawing sketches, so I took advantage by getting two from the artists at the booth at the time. 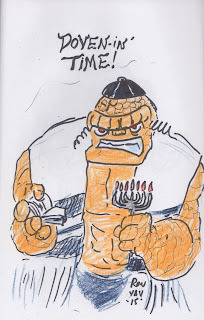 This first one comes from Seamus Smith, who delivers a particularly angry-looking Thing. I think it's because of the red eyes. 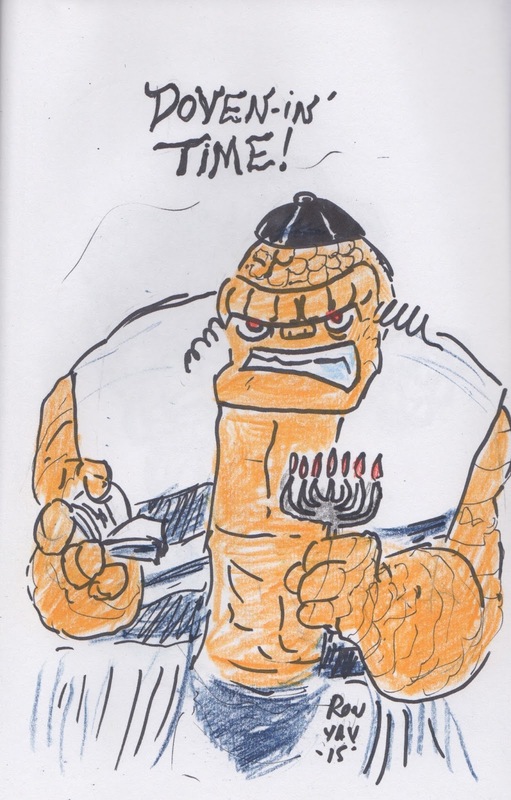 The second sketch I got at the Cartoon Art Museum booth is by Ron Yavineli, who decided to play up Ben Grimm's Jewish roots. I think he checked off all the boxes on the list with this one. You'll note that this sketch has red eyes as well. I met John at Comic-Con through mutual friends. John is a Boston native who works on his creator owned title "Boots and Pup". We talked a lot about cartoons over the long weekend and it's obvious that he knows his stuff. 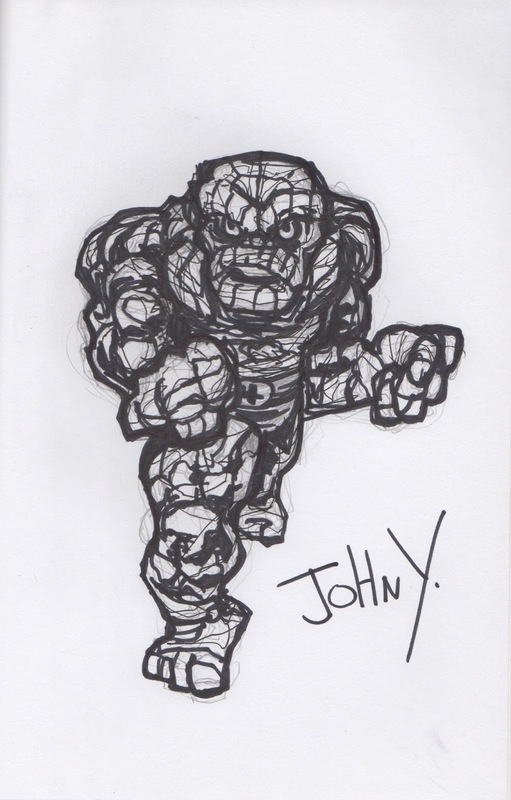 John was kind enough to draw this full-figure Thing at almost the very last minute as Comic-Con was coming to a close for the year. Never let it be said that I won't try to squeeze in as many sketches as I can when given the opportunity. I really like this entry. 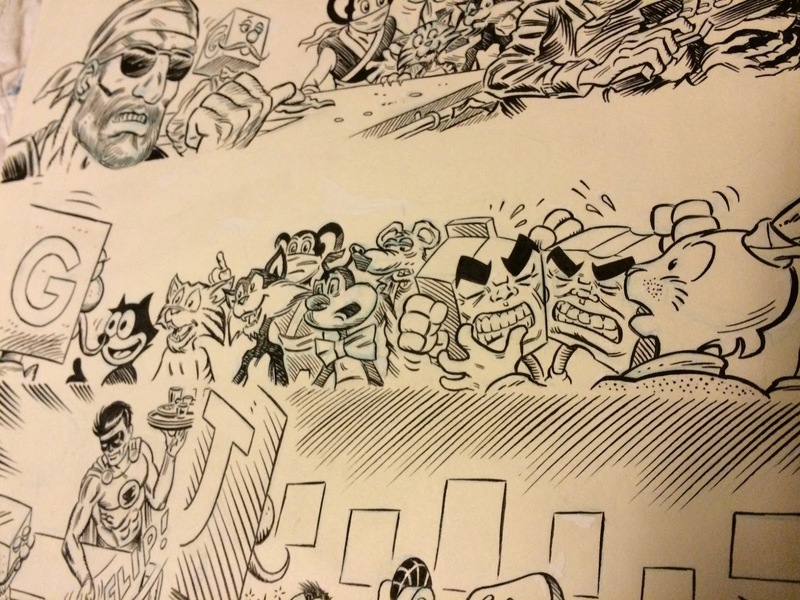 I picked up a few new pages of original art when I was at the New York Comic Con in October. There's always a big setup at the entrance to artist alley that has boxes and boxes of art from dozens of creators for sale, and it's easy to spend hours just pouring through the stacks and seeing what's available. 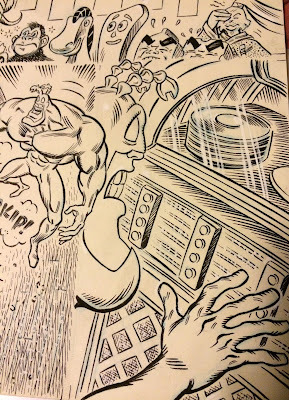 Sometimes I'm taken back by the price tag attached to some of the pages - there are several pieces of newer artwork with asking prices in the four and even five-digit range. It serves as a reminder as to how serious some fans and collectors can get about comic art. I sometimes wonder who has the means to spend ten grand on a Avengers vs. X-Men page from a few years back, but I guess there's always someone. For my own part, I tend to buy more affordable pieces. The most I've ever spent on a page is around $300, and even then I think I saw my house lights shutter and dim when I completed the transaction. 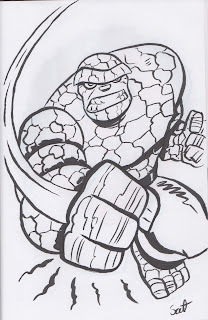 I guess I went especially cheap this go-round, as I picked up some of the least expensive pages at the table, but I still walked away happy and with some neat original art from some recent Fantastic Four issues. The first page comes from Fantastic Four #538. This was part of the uneven Straczynski/McKone run that was, honestly, sidetracked by the Civil War storyline too often. 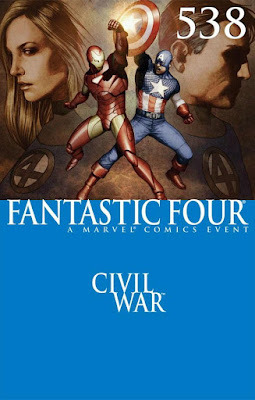 When Captain American and Iron Man are featured more prominently on the cover than members of the FF, something fishy is going on. Anyway, the page I bought is obviously incomplete, with only two of eight panels drawn. This page was most likely one in which Mike McKone redrew the two panels to take the place of two earlier ones. I'm not sure if McKone went ahead and drew directly on this page or if inker Andy Lanning worked from McKone's reproduced pencils. I would usually guess that this is only Lanning's work, but there's no reproduced work on any of the other blank panels, so I'm not sure. I'm hoping for the best. 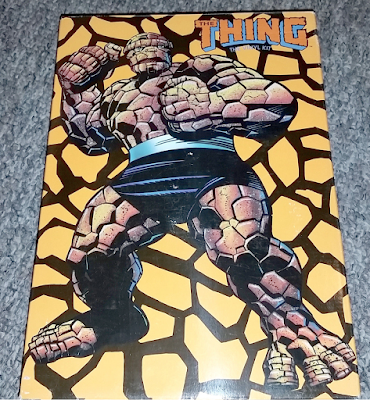 It should be apparent what drew me to this page: two panels of THE THING! For the price, it was well worth it. In this first panel, Ben is visiting Johnny in the hospital. And then he makes a revelation, or something? I guess? This was around the time that the Thing left the country for France, which was such a strange decision. It was a weird time for the FF. This second page comes from Fantastic Four #508, during the wonderful Waid/Wieringo run. 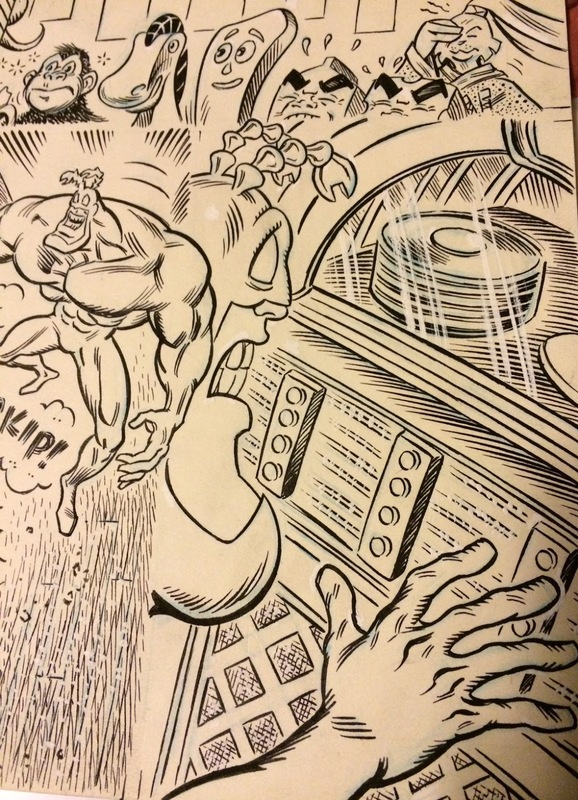 Howard Porter filled in for 'Ringo on this storyline, so this page is by Porter with Norm Rapmund on inks. 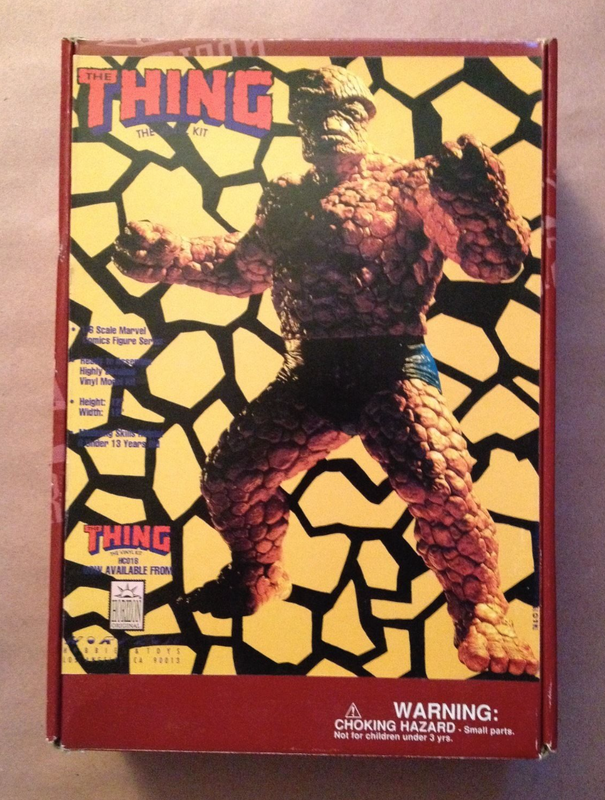 This storyline ended with the Thing being *temporarily* killed. The FF soon after went to Heaven to bring him back (for real), so he's okay now. This page was a good deal because, well, the Fantastic Four are nowhere to be found. They're in dire financial straits and they're in the process of shutting down the world-famous Baxter Building. This page is actually the final page of the issue and it has some tv-turning-off drama going for it. It's still a cool page even without the characters making an appearance. And the words "Baxter Building" do appear here, so I'm happy with it. 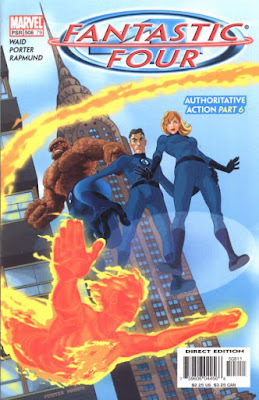 The last page I got is another "redraw" page, this one from Marvel Adventures Fantastic Four #7. 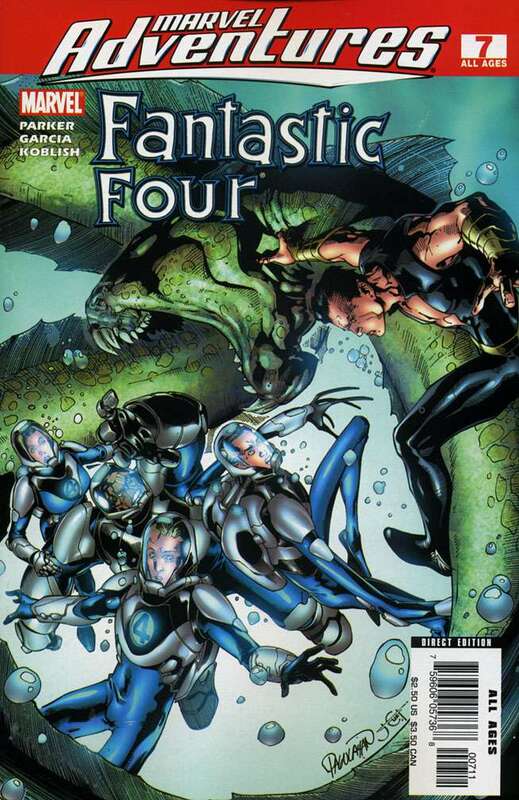 In this book, the Fantastic Four visit/fight Namor in his underwater domain. The FF are seen here in one of Sue's force bubbles. It's pencilled by Manuel Garcia and inked by Scott Kolbish - I believe that the original line art that is on this page is by Kolbish...the signature at the bottom looks like his, anyway. The page was originally supposed to be sold as part of a set with the complementary artwork, but I guess these got separated somehow. This means that I was able to pick up this partial page for only five bucks! That works for me. The total amount I paid for these pages probably could have bought me one decent, complete page. That's probably what I'd do most days, but this time around I'm happy to add these snippets to my collection. I think they're pretty neat.